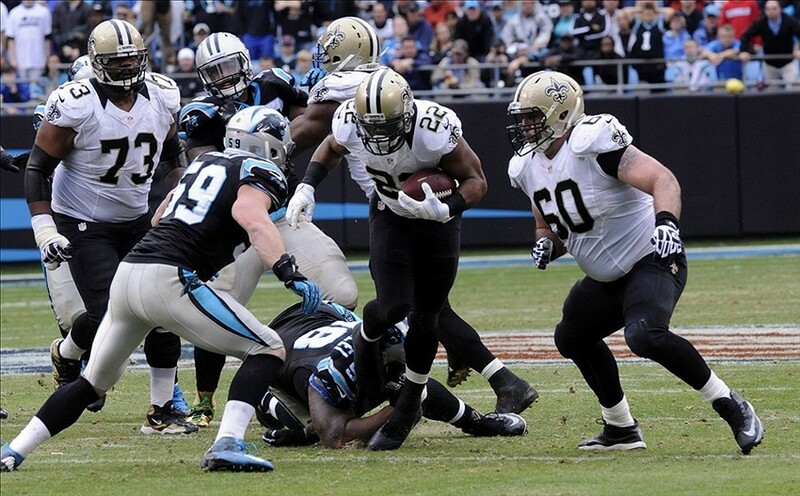 Tonight’s NFC South showdown figures to be a very intriguing one as the Saints hit the road to take on the Panthers. Not only do these teams tend to light up the scoreboard when they play each other, but both teams are fighting for their playoff lives. Sitting at 3-6, the Panthers can’t afford to lose division games at home as even 9-7 at this time doesn’t seem like it will enough for the wildcard. Despite winnable games following this one, the Saints would really like their positioning if they pulled out a win tonight. A win would get them to 5-5 and their schedule indicates that a record of 9-7 or 10-6 to at least be in the mix is possible. As is tradition at this point, Drew Brees continues to hold off father time and has been one of the league’s top quarterbacks this year. The Panthers have an inexperienced secondary, but they have improved since their week seven bye. Despite that, Brees has shown he can exploit secondaries with the best of them, so another big game could be in store. Once again Brees has some talented pass catchers around him. Brandin Cooks had a huge game earlier this year against the Panthers, and his big play ability once again could come to life in what figures to be a shootout. Start him with confidence in all fantasy formats. Rookie Michael Thomas has emerged in the last few months as a real threat to watch the rest of the year, and in the future. Thomas has shown he has gained Brees’ trust, and the ability to win at various levels of the field. He should see 8 to 10 balls thrown his way in this one. Willie Snead hasn’t had a ton of huge games yardage wise, but you know Brees is going to throw the ball his way. With a floor of what seems to be seven or eight targets a game, Snead is a safe play in points per reception fantasy leagues. Coby Fleener might be on a new team, but his tendencies to show flashes and then disappear has remained. The Panthers linebackers are among the league’s best in coverage, so it would be tough to trust him for fantasy purposes. The Saints running game has had its ups and downs this year, but doesn’t loan itself well in their matchup this week. Since their bye, the Panthers have allowed just over 3.5 yards a carry on the ground, an no opposing running back has scored a rushing touchdown on them since week four. Mark Ingram seems to have taken back his role as the starter in this running back committee, but even if he sees 15 or so touches makes for a risky fantasy play considering the matchup. Tim Hightower also figures to see seven to ten carries in this one and could also play an impact in the passing game. While this has been a far from ideal followup to his MVP season, Cam Newton has a great chance to get back on track this week. The Saints have really struggled defending the pass, and now with less than a week to prepare, Newton could feast in this one. In terms of the Panthers passing attack, the only two options that have provided trustworthy are Greg Olsen and Kelvin Benjamin. Like a fine wine, Olsen seems to have gotten better with age throughout his career. While he hasn’t had a huge game of late, this could be where he makes his mark as Newton figures to throw around ten passes his way. Benjamin also has been lacking in terms of huge performances lately, and figures to be shadowed by Delvin Breaux who is currently listed as questionable to play as of this writing. Still, Benjamin should be started with confidence as you know Newton will look his way early and often. Devin Funchess remains a wildcard in the Panthers offense regarding the upside he brings, but Ted Ginn has been the more reliable player for the Panthers. Considering Ginn has almost 30 balls thrown his way in the Panthers past four, he makes for a sneaky third receiver play this week. After a rough game on the ground against the Chiefs this past Sunday, don’t be surprised if Jonathan Stewart bounces back in a big way this week. The Saints rank near the bottom third in the league against the run, and they’ve allowed their fair share of touchdowns to opposing running backs. Stewart figures to see around 20 total touches, but in the event the Panthers gameplan to keep Brees and company off the field, that figure could be higher. This game is a tough one to predict, and while it should be offensive oriented, it’s the defenses that helped me draw my conclusion. Despite the questions in the secondary, I have more confidence in Luke Kuechly and company to make some big stops when the Panthers need them. My prediction is Saints 23 Panthers (-3.5) 27. This entry was posted in NFL, Picks against the spread, Week 11 Predictions and tagged 2016 NFL Predictions, 2016 week 11 fantasy football predictions, 2016 week 11 predictions, Brandin Cooks, Cam Newton, Carolina Panthers, Coby Fleener, Delvin Breaux, Devin Funchess, Drew Brees, Greg Olsen, Jonathan Stewart, Kelvin Benjamin, Luke Kuechly, Mark Ingram, Michael Thomas, New Orleans Saints, NFL, Picks against the spread, Ted Ginn, Tim Hightower, Willie Snead. Bookmark the permalink.